Are you tired of the constant barrage of attacks on your pay and benefits? You don’t have to sit idle on the sidelines and take it. 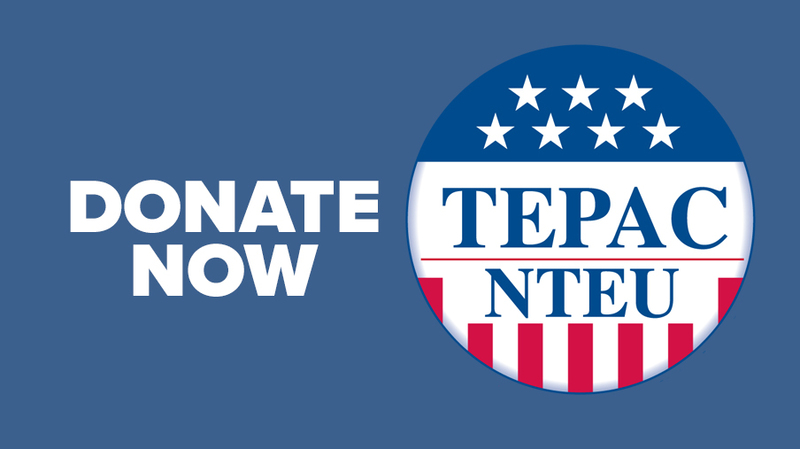 By contributing to the Treasury Employees Political Action Committee (TEPAC) you can actively support those in Congress who protect federal employee interests and help send home—for good—those who don’t. Donate right now by credit card or complete and send a TEPAC credit card contribution form. Sign up to contribute through payroll deduction and mail it to TEPAC. Bump up by increasing your payroll deduction. Those lawmakers who want to freeze your pay again and further cut agency staffing? You can help send them home. You can send them home by supporting TEPAC, NTEU’s political action committee. TEPAC is funded by voluntary contributions from NTEU members like you, and never dues money. NTEU carefully and strategically decided which candidates of both parties to support based solely on their stance on federal employee issues. At this time when federal employees are under fire like never before, a strong TEPAC is crucial. Over the past several years, dozen of proposals have been introduced in Congress that threaten your retirement, cut your pay and awards, undermine your health benefits and slash agency funding. Those who are working against federal employees are using their PACs to donate money to lawmakers who advance these harmful bills. It is imperative that NTEU match the opposition with our own collective efforts. Act now and help make a difference in electing a Congress that will treat you and all federal employees with dignity and respect. Get answers to frequently-asked questions about TEPAC.